This week, I'm obsessed with little boy shoes. They have little "Woody" station wagons with surf boards on top on the straps! No one told me it would be this fun to shop for little boy shoes! For months, Eddy has been wearing several different pairs from a collection we have of tiny little leather booties like this. I love these little shoes because they are easy to slip on and off, they were a great transition between being a barefoot kid to getting used to shoes, and I think it helps them feel their little toes on the ground which helps them confidently take those first steps. We wore out many of these little shoes. Shortly after Eddy started walking, we decided to graduate to some big kid shoes. His friend, Olivia, wore Keen sandals all last summer and I just love the little version of them. The instant we put them on Eddy, he began walking faster and more sure-footed over rocky terrain. The first night he wore them around the house, Tim exclaimed, "Look! He's practically running!" He also has two adorable pairs of shoes that are just a bit too big. My mom sent him these navy blue TOMS and my sister sent him these Converse. So, here's what no one tells you about toddler shoes - THEY STINK! He has stinky little feet at the end of the day. I guess I kind of figured that stinky feet came along with B.O., which happens sometime in the 3rd grade. I know this because in my years of teaching, things would be so normal after recess and would dramatically shift to terrible about midyear. I'd have to have my annual deodorant pep talk with a handful of boys. But nope. Stinky feet start from the get-go. Thankfully, I can just toss these suckers in the wash every few days. Now he loves to let me smell his feet and the end of the day. 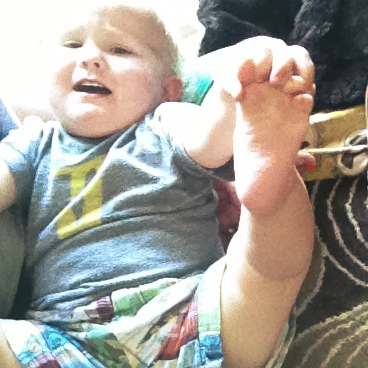 I plug my nose and say, "OOOOOEEEEE those are some stinky feet!" and he craaaacks up. And this week, Eddy is obsessed with wheels. I think this actually goes beyond obsession. He has been into wheels for over a month now. He got lots of big dump trucks for his birthday and would push them around from time to time until one day he turned one upside down and the rest is history. He will find wheels no matter where we are and be perfectly content to sit and spin indefinitely. He has approached elderly people with walkers and people in wheelchairs and when I apologize as I pick him up they usually just insist that he keeps playing. They probably don't generally encounter people that find their wheels so exciting. Skateboards, strollers (everyone's but ours), shopping carts, bikes, steering wheels, wagon wheels, cars, trucks. Any shape, any size. As I did some yard work on Wednesday morning, I pulled 2 skateboards out of the garage and he was totally occupied for 30 minutes. He tilts his head down to look at them from all angles, inspecting the mechanics of how these marvelous things work. Obsessed. With this kid, with his growing brain, with his constant motion. All of it. Awww! What is it with boys and things that move! Oliver loves wheels too - well, provided they are attached to a car or truck of course :) Shopping for boy shoes is fun... I just got ollie his first pair of Converse and they are super cute! the tiny converse are AMAZING! everything is just so dang cute! i definitely buy stuff for e before i do for myself. Haha what is it about boys and things on wheels? And I guess the obsession doesn't end, does it? 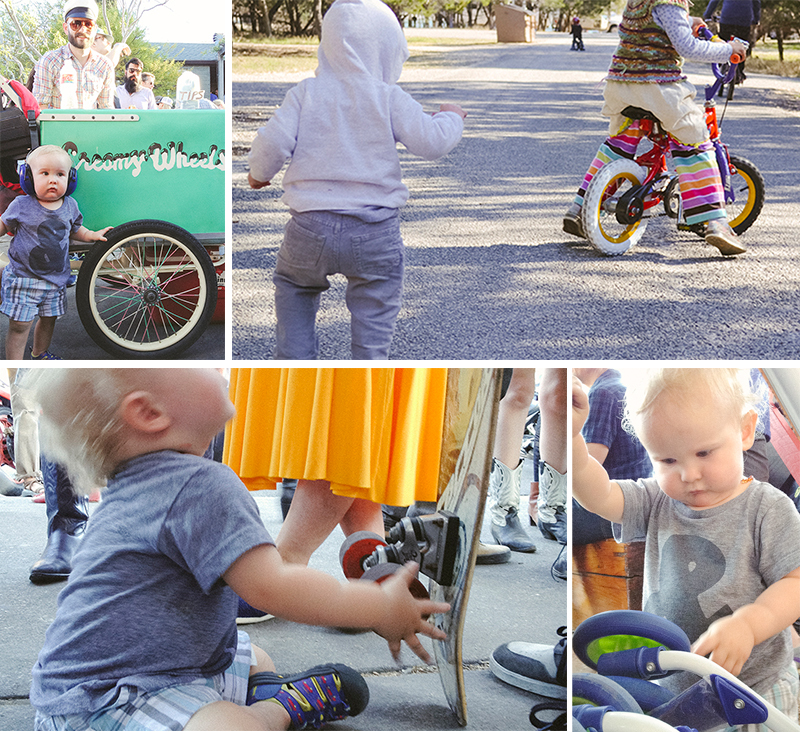 Skateboards, bikes, fast cars... things that scare mamas. 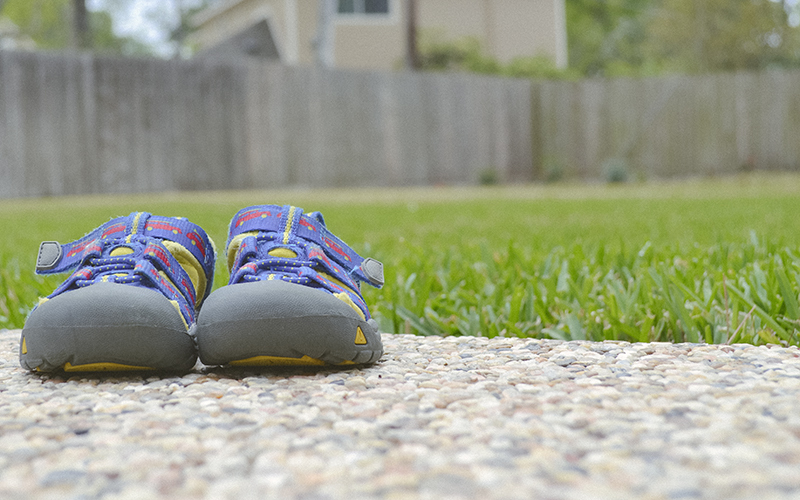 Keen sandals are the best kid shoe-- we love them over here too. Those for surely cause stinky little feet! Haha. Oh my goodness. Tell him to slow down a bit! He is so amazing and those eyes full of wonderment. I just can't believe what a little sweetheart he is! Stinky feet and sweaty boy head. Such a boy even when they are babies. Does Eddy laugh at his own farts? Jarvis started that one when he was around one year old.